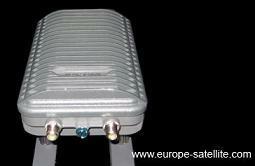 Hardware (Dec 2013) shown here: Linksat Surfbeam modem with single cable to the outdoor VSAT dish. The ViaSat DOCSIS/SurfBeam VSAT hub and modem were developed from hardware and software for the cable modem and Direct-to-Home satellite television markets and then extended for use in the WildBlue and Telesat Ka band satellite VSAT systems in the US and Canada. 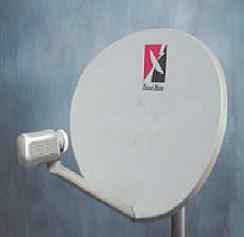 Components comprise an outdoor offset parabolic antenna plus a Ka band transmit/receive integrated assembly (TRIA) and feed, plus an indoor modem. 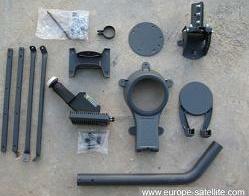 The antenna is dual optics to improve the cross-polarisation performance while minimising the forward size. A pair of coaxial cables connect the indoor unit to the outdoor unit. These carry both DC power, frequency reference and the transmitted and receive carrier signals. The workmanship on the four F connectors on these cables are critical to long term satisfactory operation. The centre pins must insert fully into the sockets and the outer braids must make good contact also . Silicone electrical contact grease and self-amalgamating rubber sealing tape is recommended for the outdoor F connectors. 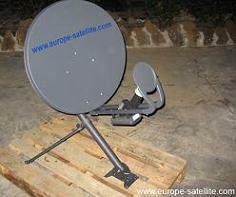 The service operate on two satellites now, on Eurobird 3 in Ku band and on Hotbird 6 in Ka band. The 96 cm Ku band antenna is shown above. 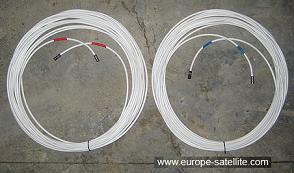 At Ka band the smaller 67 cm Wildblue, blue coloured, dual optics antenna is used. From March 2011 service on KA-SAt will start. 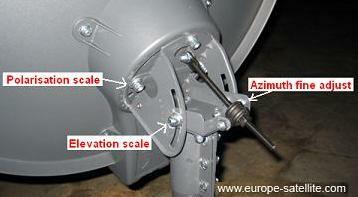 Antennas size 71cm, single reflector and circular polarisation. On Hotbird 6, Ka band, all Spanish and French terminals receive the same downstream that is the French one as downlink coverage is the same for both K153 (Spanish) and K159 (French) transponder. The difference is that Spanish terminals will transmit on K153 while French ones will transmit on K159 as the uplink has a different coverage. Advanced modulation and turbo FEC coding are combined with dynamic propagation fade mitigation techniques to give your bandwidth the ability to carry more bits in clear sky conditions, which applies for the majority of the time. Compared with the current DVB-S standard, which uses fixed QPSK modulation and FEC code rates, these features achieve significantly higher average capacity. Ku band (12/14 GHz) suffers from rain fading and Ka band ( 19/29 GHz ) much more so. Both benefit from these clever techniques. At Ka band the relatively high satellite eirp downlink beam ( 52 - 55 dBW ) on Hotbird 6 satellite and the four high G/T spot beams for the uplinks help minimise the rain fade problem. 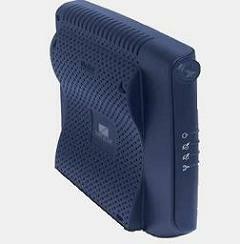 The DOCSIS modem is just 9 x 9 x 1.5 inches, and may be mounted vertically on edge to improve thermal cooling. It is a neat design which leaves desk top space for other personal computing and telecommunications equipment. Don't put it where the sun can shine in on it or above heater! It interfaces to your computer or home network hub or switch via a standard Ethernet connection and does not require any software installed on your PC. You may use a wireless router or switch to connect several PCs. 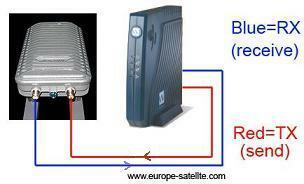 Mass produced, low cost broadband satellite modem. Always on high-speed connections. Dynamic multi-rate forward link provides high availability even during rain propagation fade conditions. Rate adaptable MF-TDMA return link. Built-in data security. QoS giving priority to certain packet types. Standard 10/100 Mbps ethernet connection. Remote management and control. No PC software required. Self installed or by a professional VSAT installer. 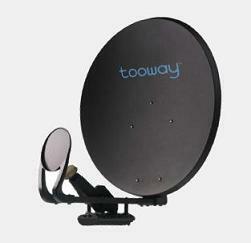 The Tooway � services are operated by Eutelsat / Skylogic Skypark teleport in Italy, using capacity on the Eutelsat KA-SAT and Hotbird 6 satellite in Ka band and Eurobird 3 Ku band satellite and are resold to end user retail customers by several European value added resellers. The text above is based on information provided by email from El Molino and extensively further edited by me to put my slant on the project. This is NOT a paid for advertisement. Page started 23 Jan 2008 ECJ, last amended 29 July 2015, 12 Jan 2017.